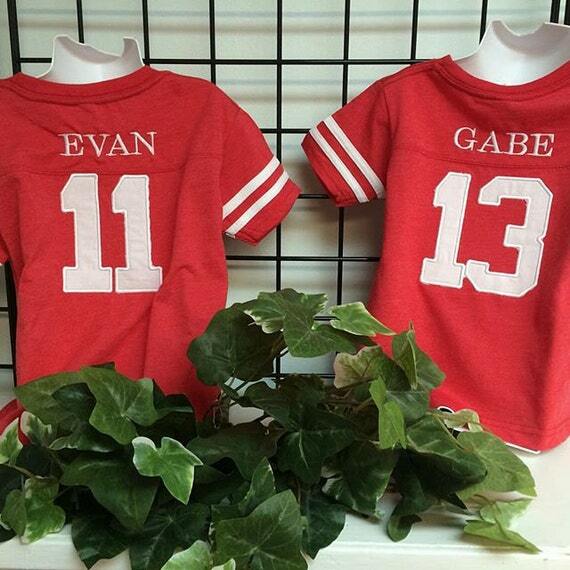 This is an adorable football jersey tshirt with a number on the front and a name and number on the back. Numbers 1-9 available. If you want a two digit number there is a $6 charge. Please convo us to add that is you need it. This shirt is cotton and comes in all sorts of great colors! We can get hot pink, light grey, charcoal grey, red, Royal and feathered navy. Sizes 2T,3T,4T. Great for birthday or everyday. They run pretty true in size. If you like them to fit big order up one size. I have had requests for entire families to have shirts. We are able to do that. We can get onesies in 6M, 12M, and 18M. Toddler sizes are 2, 3, 4 and 5/6. Youth sizes are S (6-8), M (10-12), and L (14-16). Adult sizes are S, M, and Large- they are a unisex size. Adult shirts are $29.95 and 2xl should add $5 additional. My embroidery is done on a professional machine. None of the crack and peel transfers here! Pull them straight out of the dryer and smooth out the embroidery and you are good to go. A low iron is ok once in a while but can burn the thread if you get it too hot. Please specify the name and number you want on the order in "note to seller" at time of purchase. All my orders will be completed and ready to ship within 2!weeks. I try very hard to keep things done up on time. I use priority mail to ship out so they promise 2-3 days and you will have a tracking number so you know exactly where it is. If this is unacceptable there is always overnight shipping for their fee, please contact me first to make sure I have time to complete your order.